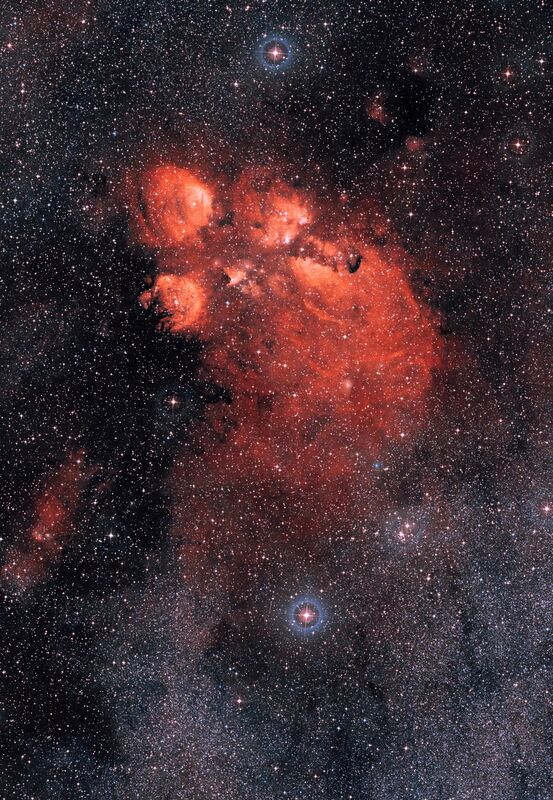 Few objects in the sky have been as well named as the Cat’s Paw Nebula, a glowing gas cloud resembling the gigantic pawprint of a celestial cat out on an errand across the Universe. British astronomer John Herschel first recorded NGC 6334 in 1837 during his stay in South Africa. Despite using one of the largest telescopes in the world at the time, Herschel seems to have only noted the brightest part of the cloud, seen here towards the lower left. NGC 6334 lies about 5500 light-years away in the direction of the constellation Scorpius (the Scorpion) and covers an area on the sky slightly larger than the full Moon. The whole gas cloud is about 50 light-years across. The nebula appears red because its blue and green light are scattered and absorbed more efficiently by material between the nebula and Earth. 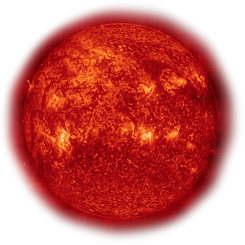 The red light comes predominantly from hydrogen gas glowing under the intense glare of hot young stars.